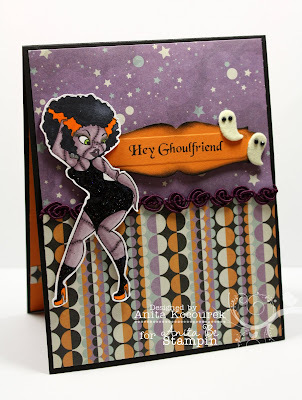 Anita Be Stampin: Hey Ghoulfriends! Today I am sharing a card made for Anita Be Stampin Challenge #25. The challenge this week is to make a Halloween card, and so I grabbed my Frankenbride rubber stamp set, which was just also released as a digi image today. There is a $25 Anita Be Stampin gift certificate up for grabs this week...gotta love that! I hope you'll stop over to the Anita Be Stampin Challenge Blog and check out the fabulous creations made by the ABS design team. They rocked it! This is soooo cute! LOVE the papers, the design and the pops of orange. I totally almost gave her colored streaks too, how funny! Glad to see you back and creating.. I always love your work.